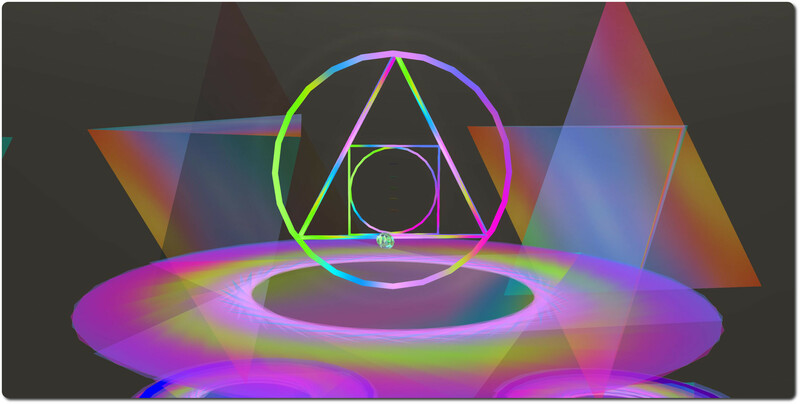 This project began as a self guided spiritual learning path but quickly became an all-encompassing Journey of Ascending To A Higher Place with each individual choosing how they want to perceive the experience and to what degree of Complexity and learning they choose. Life is a continuous journey of choices, represented by the many choices provided for you at many levels. So states Tansee in her opening remarks about her new exhibition at LEA16 on Sunday May 4th. Ascension is further described as “a celebration of colour, sight, sound and spirit”, and presents a series of themes and ideals in the form of an exploratory journey. This starts at an underwater landing point, where you can take a note card on the installation (recommended). Seven tunnels, each a particular colour intended to represent a specific chakra, all lead to an undersea environment which can be explored before selecting one of seven ropes and climbing up to the Ascension island. Here one can take one of seven further tunnels, each leading out to an encircling garden which is divided into seven areas, each representing a state / mood reflective of one’s state of self (“I Know”, “I Do”, “I Feel”, etc.). Here, different activities are presented to be shared and enjoyed, with each area having a slide show present thoughts on self and one’s being. The circular nature of the garden, complete with path leading the way between each of the seven areas, represents the endless infinity of birth and rebirth. The areas bordering the path are intended as places where people can seek refuge, relaxation, renewal and a sense of spiritual growth. As well as providing access to the garden, the central Ascension island offers visitors a very literal journey of ascension, flying up through a series of chakra spheres, each one offering the opportunity to learn about the chakra in question, and the emotional states associated with it. Each sphere provides a place of rest and meditation, so one’s journey need not be rushed. For those who prefer, teleport boards offer a means of moving up and down between the spheres – although I recommend flying, as it’s easy to miss things along the way when teleporting. 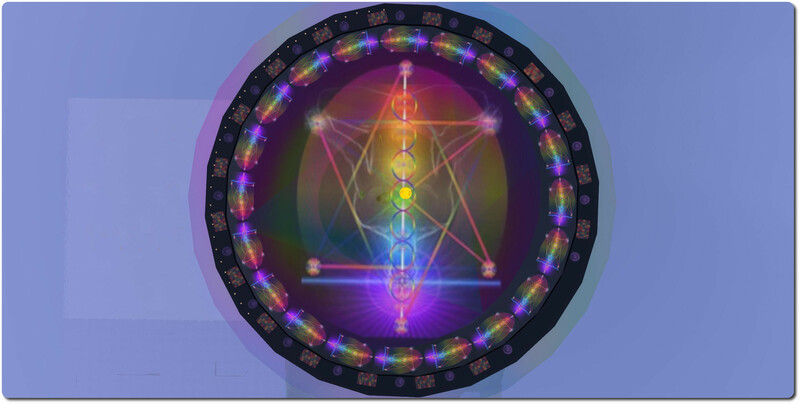 At the very top of the installation is a MerKaBa, a vehicle of Ascension, which it is believed can be activated by certain principles in meditation. These involve breathing changes, and mind, heart, and body changes that alter the way a person perceives the reality. A fully activated MerKaBa field enables you to turn your body into a ball of light and bring it with you as you travel between worlds on different spiritual planes. Towards the back (north side) of the installation is the International Mountain of Peace, a place where visitors are invited to use a series of direct input boards to leave their own thoughts with the world on matters of wisdom, love, hope, peace and more, either signed or anonymously. To mark the opening of the installation, The Ascension will be hosting a special live performance. 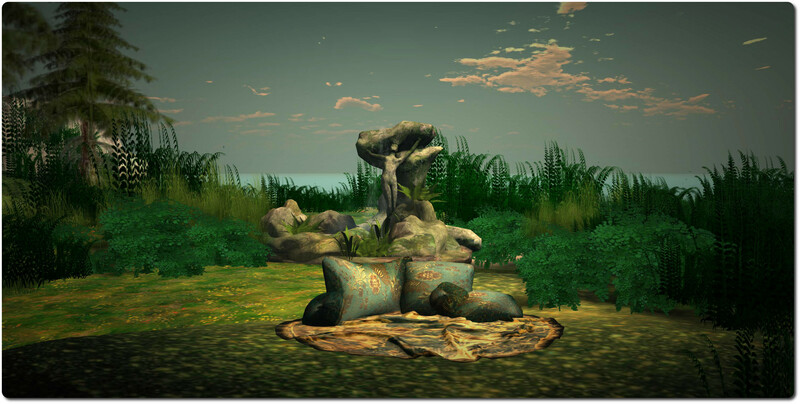 Sky Fires, will feature the work of Particle Tom and Lexi, with music by DJ Sunshine. 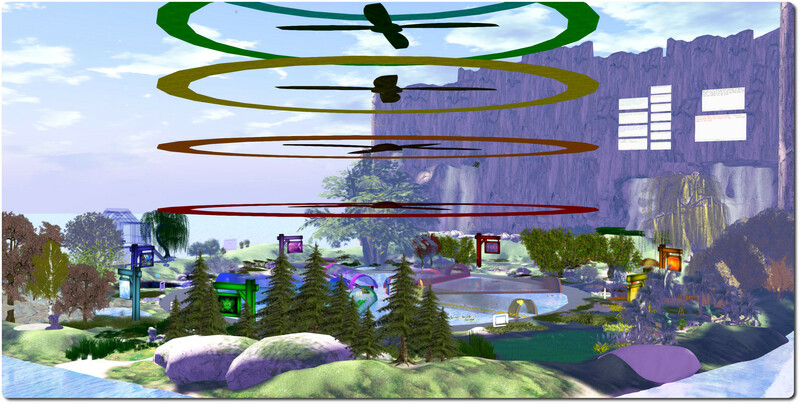 The event will take place at 14:00 SLT on Sunday May 4th, on the Chromatic Atmospheres particle platform. Things are starting to pick-up on Mars once more as Curiosity starts into a new round of science studies in the region dubbed “The Kimberley”. Having been surveying the region since its arrival there at the beginning of April, the rover was commanded to move to a sandstone slab scientists dubbed “Windjana” after a gorge in Western Australia, and is in keeping with giving notable landmarks in the area unofficial names lifted from that part of Australia. The slab lay a short distance roughly southwards from the rover’s position where the Mars Reconnaissance Orbiter (MRO) imaged it on April 11th, 2014. Following the initial selection of the slab as an area for further study, the rover was commanded to drive closer to it to enable further visual inspection. The slab is around 60 centimetres (2 feet) across, and was selected because it offered a good surface for drilling, and lay within what scientists call the “middle unit” because its location is intermediate between rocks that form buttes in the area and lower-lying rocks that show a pattern of striations. A white-balanced image, calibrated, linearly scaled and brightened to present colours that resemble those that would be seen under daytime lighting conditions on Earth, of the rock dubbed “Windjana”. The image combines several exposures taken by the Mastcam’s left-eye camera during the 609th Martian day, or Sol, of the rover’s work on Mars (April 23rd PDT, 2014). The sandstone rock in the area is of particular interest to mission scientists because it represents a somewhat different environment to that studied extensively by Curiosity during the time it spent in the “Yellowknife Bay” area, drilling and sampling mudstone rocks. Understanding why some sandstones in the area are harder than others also could help explain major shapes of the landscape where Curiosity is working inside Gale Crater. Erosion-resistant sandstone forms a capping layer of mesas and buttes. It could even hold hints about why Gale Crater has a large layered mountain, dubbed “Mount Sharp” (officially called Aeolis Mons), at its centre. 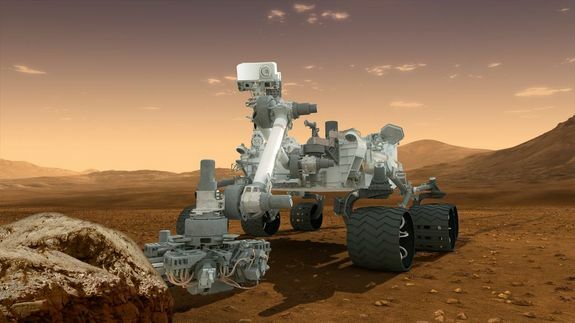 Once the rover had positioned itself close to the rock, initial inspection operations were carried out, which included using the turret-mounted spectrometer on Curiosity’s robot arm as well as the mast-mounted ChemCham laser so that the rock could be properly analysed ahead of any drilling operation. These operations also included deploying the rover’s “wire brush” to clean an area of the rock’s surface, removing dust and debris to expose the rock itself, allowing for further examination and analysis. Clean sweep: a “before and after” animation showing a patch of the sandstone rock dubbed “Windjana” scrubbed clean of surface deposits ready for further examination. The images used in the animation were taken by the turret-mounted Mars Hand Lens Imager (MAHLI) during the 612th Martian day, or Sol (April 26th PDT, 2014). The exposed area of grey rock measures some 6 centimetre (2.5 inches) across. Before any sample drilling could occur, however, the rover would need to carry out a “mini-drilling” operation, much as it did at “Yellowknife Bay”. Such operations both confirm the drill’s readiness for sample gathering and confirm that the subject rock is a suitable target for drilling and gathering sample material. This “mini-drilling” operation took place on Tuesday, April 29th, cutting a hole around 2 centimetres (0.8 inch) deep into the rock. This allowed the science team to evaluate the interaction between the drill and this particular rock – an important factor given issues enountered due to vibration during the rover’s previous operations – and also for the tailings of powder rock created by the drilling operation to be examined for their suitability for collection by the drilling mechanism. 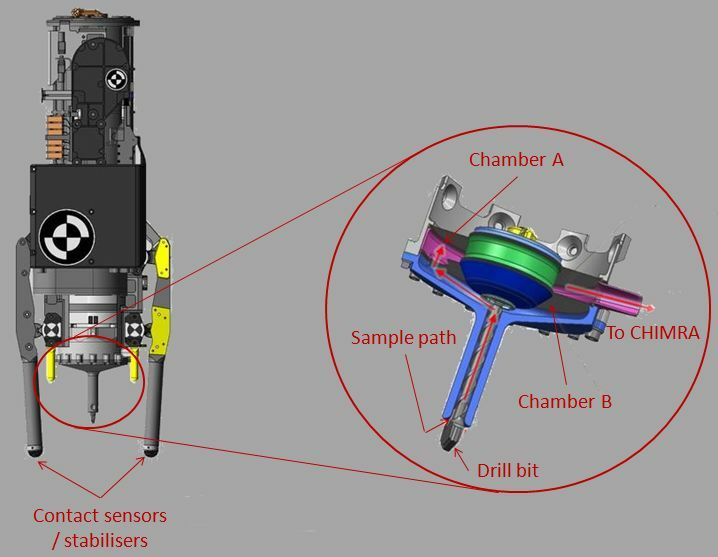 When collecting sample material, the rover’s hammering drill bores as deep as 6.4 centimetres (2.5 inches) into a target rock. As it does so, some of the tailings from the drilling operation are forced up into the drill bit itself, and delivered to one of two holding chambers (Chambers A and B in the diagram below) located in the head of the drill bit mechanism. Once drilling is complete, the gathered samples are transferred to CHIMRA – the Collection and Handling for In-Situ Martian Rock Analysis system, also within the rover’s turret system, where the tailings are sifted and sorted ready for eventual transfer to the Curiosity’s on-board chemical laboratory systems, comprising the Chemical and Mineralogy (CheMin) and Sample Analysis at Mars (SAM) suites of instruments. At the present time, the outcome of the analysis of the mini-drilling operation, and the suitable of “Windjana” as a sample-gathering point is unclear; however, it would appear likely that sample drilling operations will go ahead nearby as a result of this test. An image from Curiosity’s Mars Hand Lens Imager (MAHLI) instrument shows the “mini-drilling” operation hole cut by the rover’s drill mechanism on Sol 615 (April 29th PDT, 2014). The hole is some 2 centimetres deep and 1.6 centimetres in diameter. Curiosity racked-up another first on Sol 606 (April 20th), when the Mastcam captured the first image of asteroids taken from the surface of Mars. The image was combined with pictures captured the same night of the Martian Moons Phobos and Deimos, and the planets Jupiter and Saturn. Deimos, the outermost on the Martian moons, and which may have itself been an asteroid prior to wandering in Mars’ gravitational influence, appears at its correct location in the sky at the time the image of Ceres and Vista was captured. Phobos, Jupiter and Saturn, which were all imaged at different times, are shown as inset images on the left. All of the images form a part of ongoing astronomical work the rover has been performing periodically. Ceres, with a diameter of about 950 kilometres (550 miles), is the largest object in the asteroid belt, large enough to be classified as a dwarf planet. Vesta is the third-largest object in the asteroid belt, about 563 kilometres (350 miles) wide. These two bodies are the destinations of NASA’s Dawn mission, which orbited Vesta in 2011 and 2012 and which is now on its way to begin orbiting Ceres in 2015. The main image appears grainy, with Ceres, Vista and three stars appearing as streaks because it was captured over a 1-2 second exposure period. The graining on the image is the result of cosmic rays striking the camera detector is the image was captured. The images of Deimos, Phobos, Jupiter and Saturn were all captured over a much shorter 0.25-second exposure, thus rendering them as bright objects against a “clean” black background. Sunlight reflected by Deimos makes it appear overly large. The interesting point (for those into astronomy) with the main image is that Vesta and Ceres would be naked-eye visible to anyone with average eyesight were they to be standing on the surface of Mars. All images courtesy of NASA JPL.